Update: Details on the format of expansions have been added below. It’s a great week for collectible card game players as not only do we have the new and exciting Warhammer 40,000 LCG on the way but we also have news of a new release of the classic Deadlands card game in the form of Doomtown: Reloaded from AEG. Doomtown was originally released way back in the nineties and was tied to the Deadlands role playing game. Set in a fantasy old west town, Doomtown includes your typical bandits and sheriffs along with ghosts, magic and crazy inventions. The real selling point of the game is that every form of combat resolution is based around poker hands. Each card in Doomtown has a standard card suite and number; however your deck doesn’t necessarily have to be a standard 52 card deck. When a shootout occurs you draw a hand of cards and the player with the highest ranking poker hand wins the shootout. Of course there are all sorts of cheatin’ and extra cards going on but that’s all part of the fun. 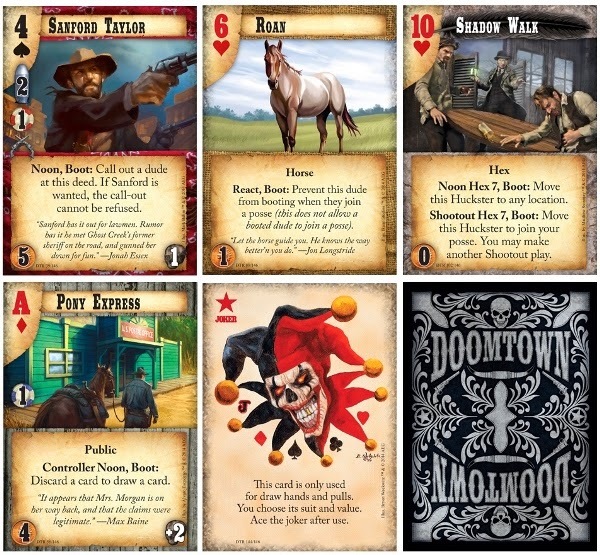 What is also striking about Doomtown is how thematic it is for a card game. Players gain resources by controlling properties and with all their properties laid out the game starts to resemble an old west street. Is this going to be AEG’s Netrunner? There are a lot of similarities between the two; both where originally released in the nineties, both are much loved with a large existing fan base and both are heavily thematic with the theme coming across strong through the game’s mechanics. AEG already mention a core boxed set that will include the cards to play one of four factions and that this will be an expandable card game (ECG). Small packs called 'Saddlebags' will be released twice a month with each Saddlebag containing four copies each of a selection of 21 cards. Later there will be larger box expansions, provisionally called Pine Boxes. This looks like it will be a carbon copy of Fantasy Flight Games LCG system but, of course AEG can't use that term as it is trademark of Fantasy Flight Games. Doomtown: Reloaded is set to be released in August, so that will be another Gen Con release then.